Winter wails around us and the furious dumpster fire that many parts of 2018 resembled seem fully poised to continue throughout 2019. It is the worst of times, it is the best of times. 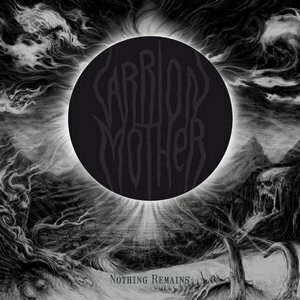 Leave it to a five piece doom group from Germany in the form of Carrion Mother to both encapsulate the spirit of the day and give us something to help cope with it: Nothing Remains. Of course the normal sonic doom tropes apply: glacial paces, crushing sounds, bleakness and aural misery personified. It’s all here. Nothing Remains is also surprisingly dynamic. That glacial pace finds cadence with tempos that rise and fall, an endearing positive with the sprawling lengths involved in each track. The will to crush is met with a restrained but endearing sense of melody. Bleakness, however, is firmly not met with a sense of hopeful drive. These songs ply the darkness and they are unflinching in that pursuit. To sell Nothing Remains as a straight doom release is to sell it wrong. Shortest track “Schwarzschild” (and the album at large) carries a deep postmetal (of the Cult of Luna variety) indebtedness. The vocals here and in general, also carry the postmetal flavor, being bellows that fall into the tapestry of sound. No cleans, no growls, this soup of sound is all a murky gray, vocals and gray alike. And that gray in spirit is perpetual as well. The shortest track is followed by the longest (a monstrous 18 minute exercise) in “ The Turning Goodbye” and is where Carrion Mother takes on its most doom-like shades: it embraces the crushed spirit and crawls. Not even toward a noble end. Toward anonymous oblivion. It’s a stellar piece of work individually and would have been worth an EP by itself. Step outside, breathe in the assorted miseries that populate the air, and give Nothing Remains your time.